The leading sustainability event in the MENA region and the accompanying exhibition took place on November 26-and 27 at THE RITZ-CARLTON Hotel in DOHA (Qatar). 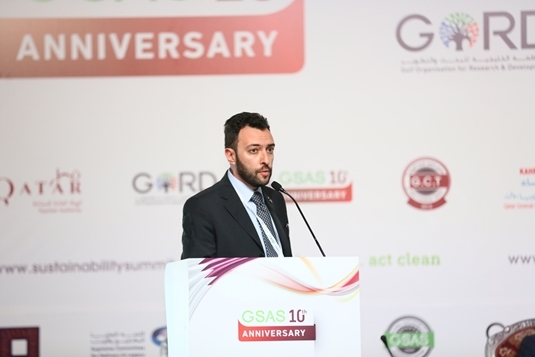 An event, organized by the Gulf Organization for Research and Development (GORD), where practitioners, experts, regulators and researchers, from all over the word, had come together to discuss various topics on sustainability and climate change..
On behalf of Task 53, Dr. Salvatore Vasta addressed a presentation on the " Solar Cooling: Worldwide Overview and New Technological Opportunities". The presentation topic ranged from a solar cooling market foresight up to 2050 to a technical focus on hybrid chillers and advanced heat/cold storage systems for the next generation solar cooling plants. As expected, the solar cooling topic has had a good response on social media, such as Facebook and LinkedIN.